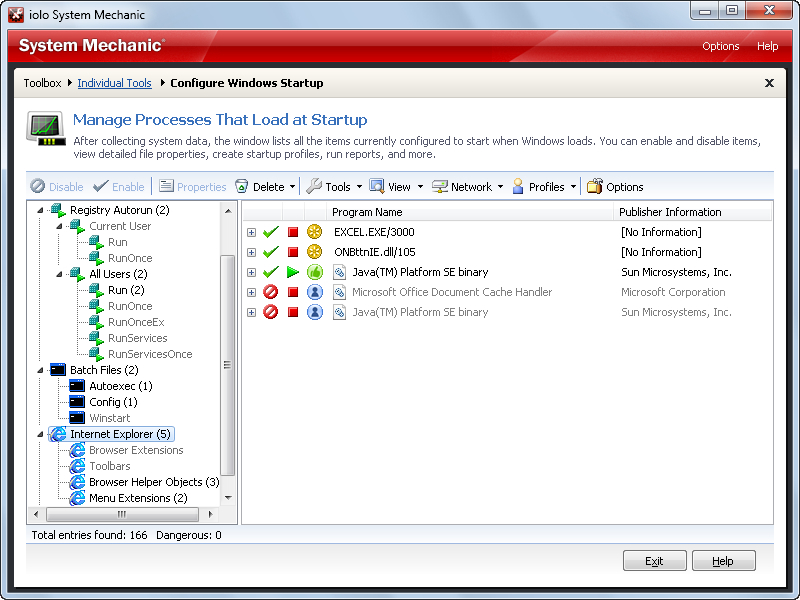 Few days ago, I wrote about System Mechanic 11 Free Version. Actually, I was offered to wrote about the paid version some time ago and since the software does have many features, I had split that to two reviews by first writing about the free version. As mentioned there the powerful Free version still lacks a number of useful features that the full standard version have. All those features make System Mechanic a suite that one can hardly complain about. If you had gone through my previous review of System Mechanic 11 Free, you must have known how nicely System Mechanic features are distributed. If you stick at the 1-Click Tools or All-in-One tools, you must haven’t learned anything about the pro version benefits. Paid version benefits are clearly hidden under individual tools. It has a total of 21 tools more in the paid version. When files and folders become highly fragmented, computer performance is significantly slowed. Regular defragmentation helps you maintain system performance and prevent data corruption. 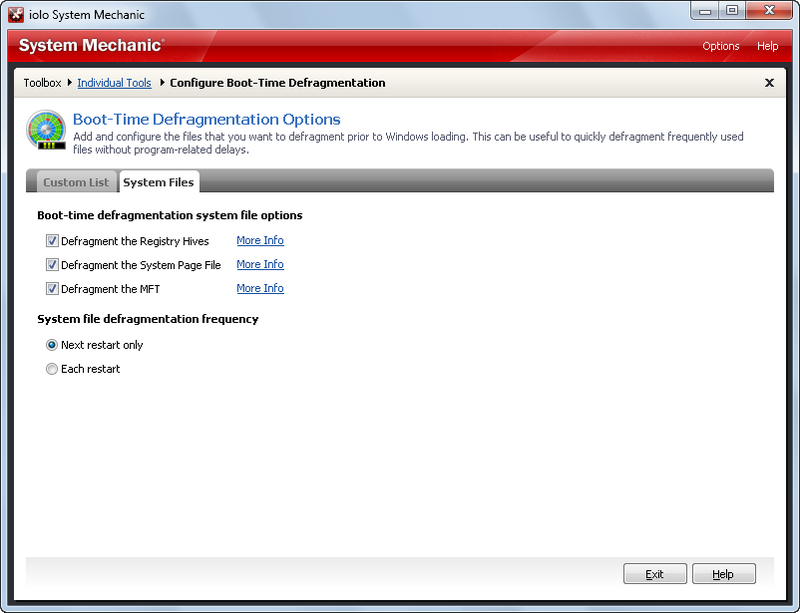 With the Free version of System mechanic you can run defragmentation. But the paid version has Boot-Time Defragmentation feature that is more useful because then defragmentation runs prior to other programs that access the files or otherwise hinders the process. Furthermore, certain frequently used system files can only be defragmented before Windows is loaded. The CRUDD (“Commonly Redundant or Unnecessary Decelerators and Destabilizers”) Remover detects and displays the redundant programs that can impact PC’s performance and stability, and lets you decide which programs you want to keep or remove. For certain types of programs, having more than one installed can reduce your computer’s performance (e.g. 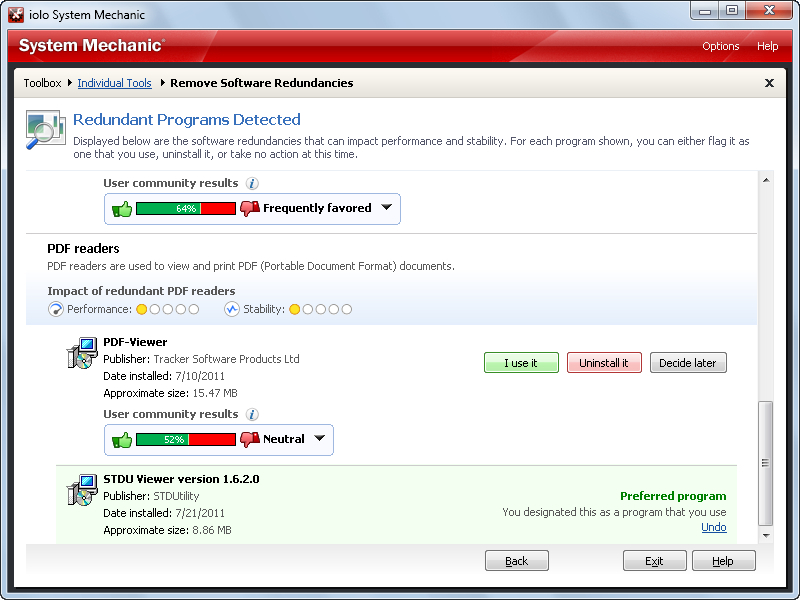 antimalware programs). Removing such redundant programs improves the overall speed and stability of a PC, by eliminating unnecessary processing, program conflicts and freeing up drive space. Often, some background processes needlessly runs and thereby slows down PC by consuming system memory and CPU resources. “EnergyBooster” wizard speeds your PC’s processing by turning off background programs and services that are running but not being used. 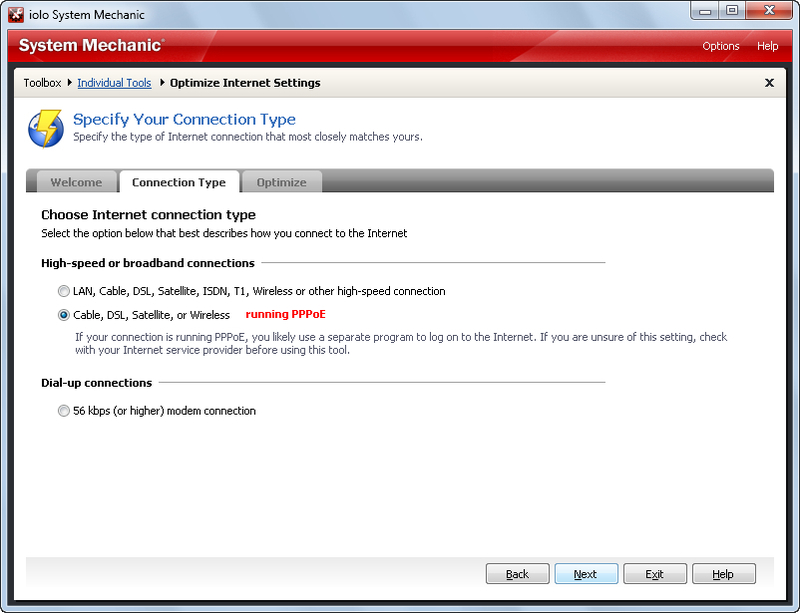 When Windows is installed, the default network settings are not necessarily optimized for specific Internet connection. This can prevent you from reaching maximum download and upload speeds. “NetBooster” wizard allows the transferring of more data over your existing connection, resulting in faster and more reliable access. Hardware manufacturers often release improved drivers for their devices to resolve conflicts, fix errors, and improve overall efficiency. Finding and installing these drivers, however, can be time consuming, confusing and potentially harmful to your system if incorrect or unsafe drivers are accidentally installed. Designated Drivers tool locates driver updates for your computer’s hardware devices that may improve efficiency and performance and lets you decide to install them automatically. Windows registry holds critical settings that are continually accessed by the operating system. With regular usage, the registry becomes overly large and fragmented. Because the registry is loaded into RAM during startup, this bloat unnecessarily eats up vital system memory – your PC’s startup processing is overburdened and the overall speed of your computer is slowed. Defragmenting and compacting the registry restructures registry entries and removes blocks of unused space. Over time, the many interdependent files that make up a program tend to drift apart and become scattered across the hard drive. This misalignment not only impacts the speed at which your programs can run, it also causes excessive movement of the hard drive, which leads to unnecessary wear-and-tear on your hardware. Program Accelerator realigns these program files on the hard drive, resulting in programs that launch faster and respond more quickly. Solid-state drives require different methods of optimization than mechanical drives. Using a standard defragmentation tool on a solid-state drive will only cause additional wear and tear without producing any benefit. SSD Accelerator uses methods of optimization specifically designed to improve solid-state drive performance. Typical disk defragmentation tools are only able to react to file fragmentation after it has happened. This means that PC performance must suffer before it can be recovered by a defragmentation tool. AcceleWrite’s technology optimizes the way information is written to your hard drive, minimizing fragmentation and resulting in better, more stable performance. Viruses and other malicious programs exploit security vulnerabilities in Operating Systems and Web Browsers. 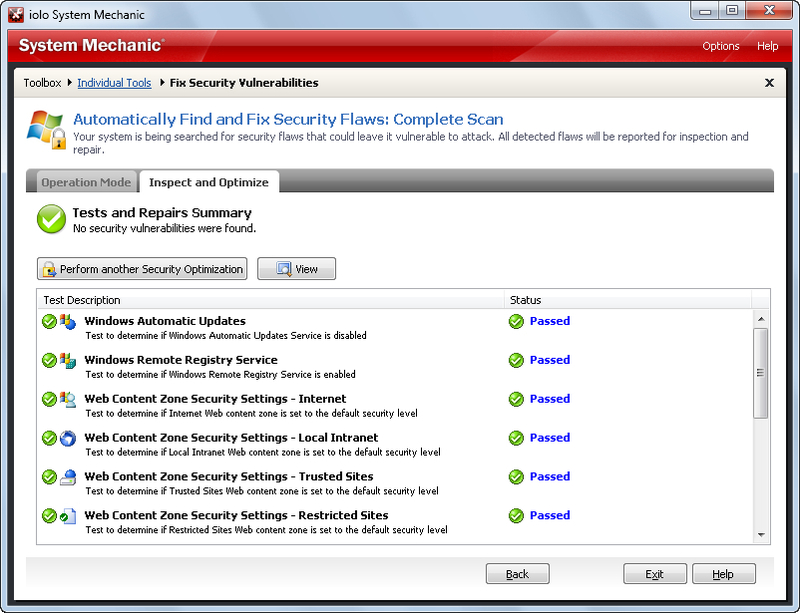 The Fix Security Vulnerabilities wizard can find and repair Windows security flaws that leave your system open to attack. Without your knowledge, malicious software can attempt to execute itself or include itself in your Windows startup process. (Trojans are usually designed to load at startup.) Hidden malware known as “Home page Hijackers” can change your web browser’s Home page and Search page to point to their site. 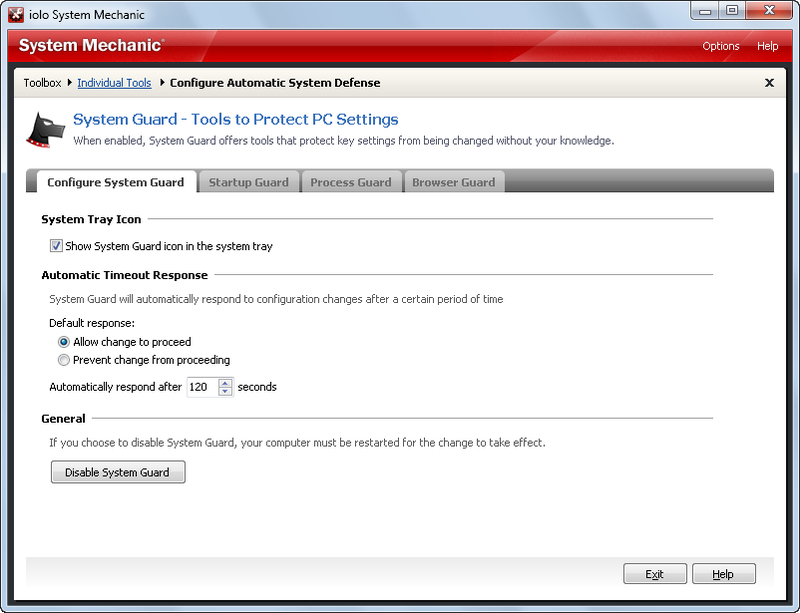 System Guard offers tools that protect key settings from being changed without your knowledge. It runs from tray and notifies you about any change. Damaged sectors on a drive can prevent files from being accessed or saved, and damaged drives frequently cause computer crashes and lock-ups. Severe drive damage can lead to a volatile computer that is practically unusable. Running the Repair Hard Drive Problems wizard to check for drive errors can repair existing issues and maintain the drive health before serious problems occur. 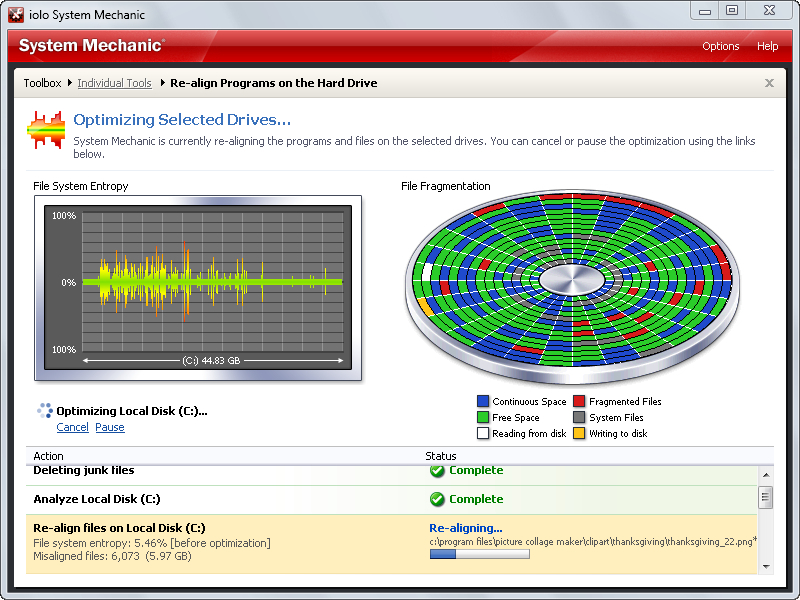 Drive Medic Emergency CD wizard allows you to create an emergency disk to use if your computer ever suffers severe damage, such as the operating system failing to load. Once created, the CD will allow you to run a DOS-based program that performs tests and repairs of your hard drives. If your PC has become unstable or unusable, it can be hard to know where to start with troubleshooting and repairs. Use the Troubleshoot System Problems wizard to read recommended solutions and access the tools that will help you regain the stable use of your computer. Incinerator or Shredder feature is also in the free version. But the paid version allows you to install a Desktop File Incinerator which gets integrated with Windows and an Incinerator icon displays on your desktop. Startup Manager lists all the items currently configured to start when Windows loads. You can enable and disable items; create, load, and save startup profiles; adjust startup settings on remote computers across a network; and more. Process Manager displays a list of all running programs and processes, and notes if any of them are dangerous. You can view detailed file properties, block processes, start processes, and run reports. Expert mode users can also prioritize running processes. Unnecessary processes overburden system resources and memory. 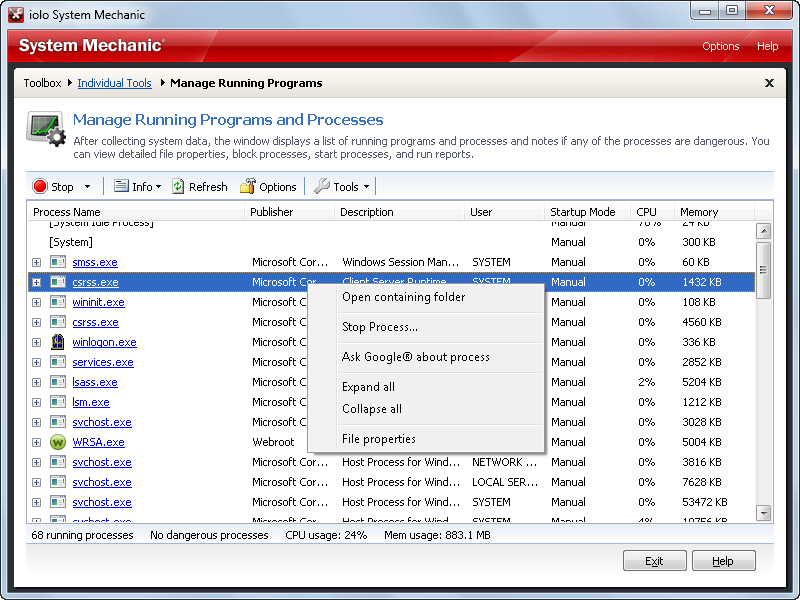 Use the Manage Running Programs to control running processes for performance and stability gains. 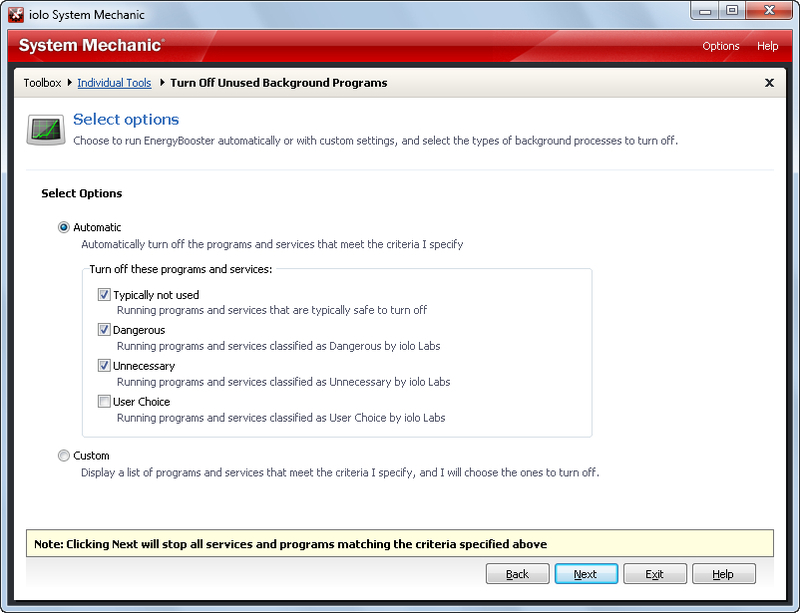 System Customizer allows you to adjust a wide range of settings to customize the appearance and behavior of over 100 Windows features. The Customize Advanced Windows Settings window provides an easy way to tweak and fine-tune settings in various areas of Windows. Many of these settings are “hidden” and cannot be readily changed without this tool. NetTuner allows advanced users and system administrators to edit Internet and network settings. This tool can help the power user achieve the most efficient Internet speeds. 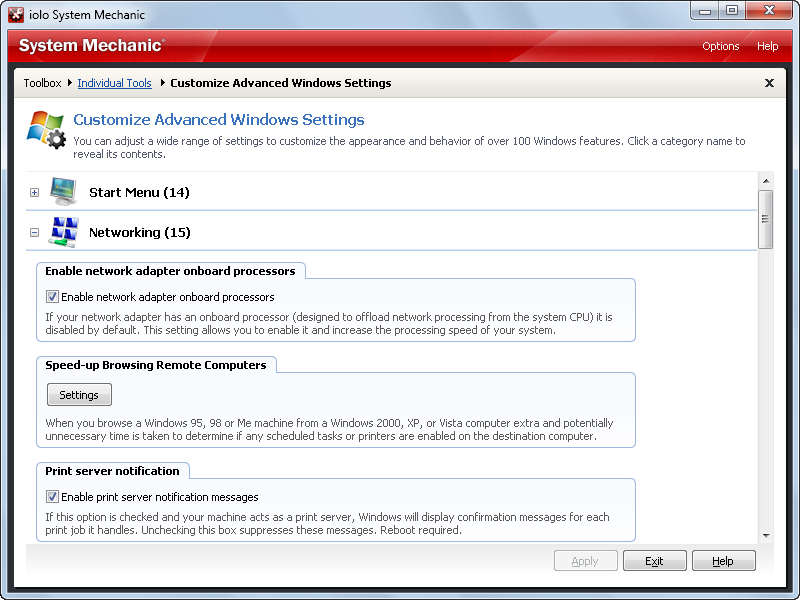 You can modify advanced network settings and experiment with different configurations for testing. DriveSense™ monitoring tool displays real-time data about the status of your hard drives, including drive temperature and other indicators of drive reliability. Monitoring indicators of your drive’s performance can keep you informed about your drives and help you take preventative action (such as backing up drives) where needed. 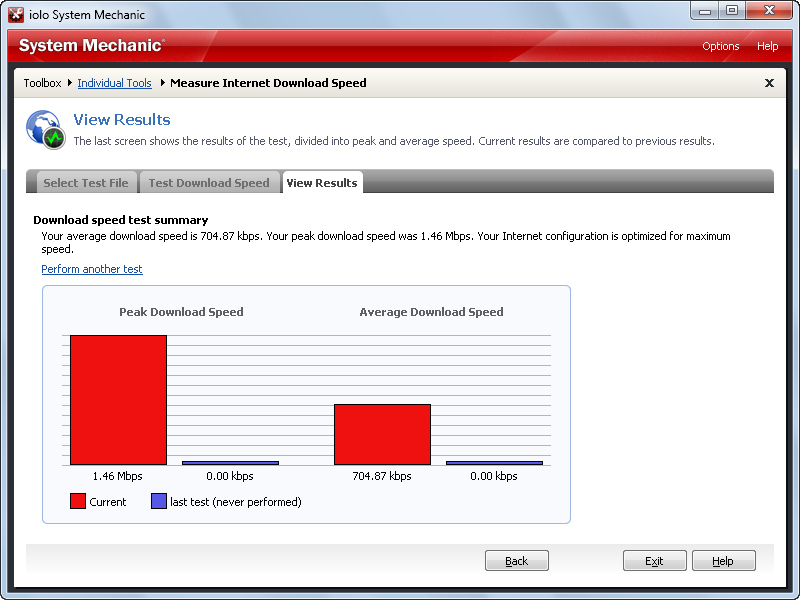 NetSpeed Analyzer runs tests of Internet download rates. To help you analyze the effect of any changes, the final screen compares current results to previous results. Testing download rates can help you refine your Internet configurations to achieve the best possible speed. Upgradation from the free version is easy. You can upgrade either by clicking on a pro feature or find in the main GUI the upgrade option. You have to go through two screens to apply the license and got the upgradation. The upgraded version shows more in depth analysis and provides better optimization of your system. In the version 11, Iolo have introduced Whole Home Licensing in System Mechanic. Today, most homes have multiple computers. Trying to keep track of the number of software license activations allowed across all machines can become complicated and frustrating, as well as costly. So, if you have purchased a license, you can install that on all your home PCs at no extra cost. 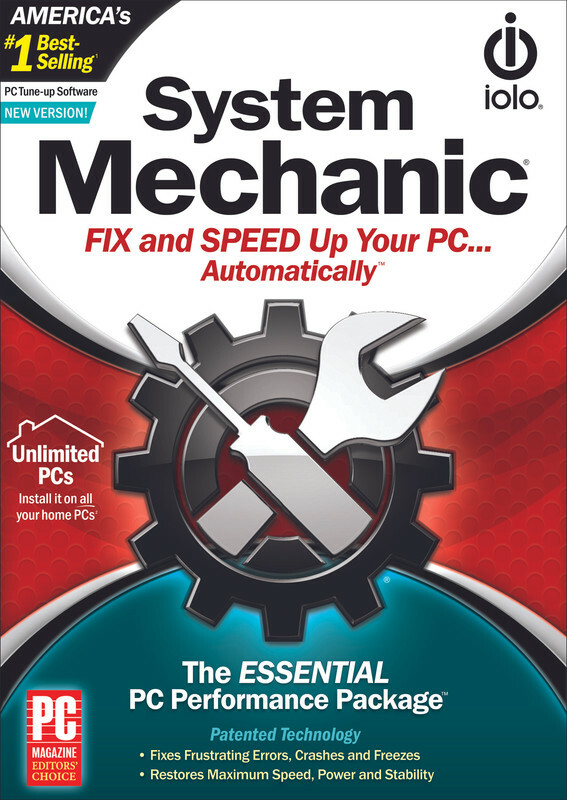 A full version of System mechanic costs $49.95 for a 1 year updates. Thanks to Jack Follman from Iolo, I have few licenses of the Full version of Iolo System mechanic Standard to giveaway among our blog readers. If you are interested in having a license please do any of the following. Post a comment to inform the method you have followed. The contest will run for a week until 7th Oct, 2012; 23:59 Hrs GMT. Winners will be selected from the entrants randomly. This entry was posted in Backup, File Management, Free Offers, Giveaway, OS Enhancement, OS Maintenance, Privacy Related, Security Related, Shred, Software, Windows. Nice review Sujay. Posted your giveaway on Tipradar. Off course My Comment So here It is- Nice, Very In Depth Review Of System Mechanic. System Mechanic, “Simply The Best”. You needed to follow only one rule in Step 1. Its good that you've followed all. Thanks, you are in. please count me in!I Iove System mechanic,but my licence is over!I hope to win! Good luck to all! Hi. Please count me in, too. I have subscribed your newsletter. I have the old version of System Mechanic. Hope to win! Thank You! I would like to have a license for System Mechanic, thanks Sujay Ghosh. I would love to participate in the drawing for a license to try this again! Very good program.Count me in. I subscribe to your newsletter. Good program. Count me in please. Amazing software which puts any other PC tune up utility out there in the dust. I successfully subscribed to your newsletter and liked your FB page. Please count me in!! and performance. Please count me in this Giveaway! I have already subscribed your Newsletter. Thank you Sujay and Iolo for giveaway. thanks for giveaway. Please count me in! Thanks for the great review and contest. Please count me in.